Suzuki Philippines is bringing the much-talked about, much-anticipated SUV, the Jimny All-Grip Pro on tour. The formal Philippine market launch, held at the BGC Amphitheater last March 8, 2019 was the first of three-legs located at strategic parts of Metro Manila. The second leg happened last weekend at the Eastwood City in Libis, Quezon City, while the third and final leg will be at the UP Town Central Plaza starting Friday, March 22 to Sunday, March 24, 2019. 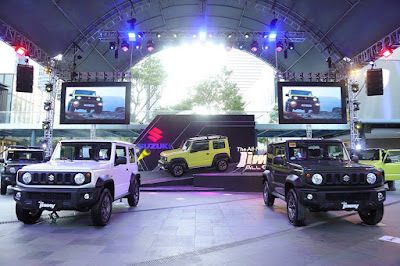 Throughout the weekend, off-road enthusiasts can check out the fourth generation of Suzuki’s trademark 4x4 and other models including the recently-launched Ertiga Black Edition. Fun activities and games await off-road adventurers during each leg of the launch.